In the surreal ambience of a fire-glow from an oil lamp and a brightly burning halogen bulb, the audience waits with bated breath as the martial art performance begins. The spectators at Kalarigram, adjacent to Adishakti, are about to regroup after being driven into a tizzy by the chendamelam by Anish Panikkar and team at Tantrotsav 2017. What’s in store would turn out to be breathtaking, gravity-defying leaps, body feints and blindingly-fast manoeuvres by Kalaripayettu artists from the Hindustan Kalari Sangam, based in Kozhikode, Kerala. However, Meltem, who has come all the way from Turkey, to imbibe the philosophy of Kalaripayettu , decides to fill the interlude with a soulful Baul rendition. And, for the next half hour or so, she plays a simple drone instrument, transporting herself and the audience to the mystic realm of Sufi thought.“The song was an offering to Goddess Kali , who is central to Kerala’s martial art ofKalari ,” Ms. Meltem says. Such unscheduled and random performances are not out of place in the scheme of things at Tantotrsav; in fact, they are an integral part of the event. While the schedule of events, by itself, presented a tapestry of classical, ritual and martial art forms, eclectic music and experimental theatre, the beauty of the Tantrotsav, is as much about the unscheduled free-form and impromptu performances by those watching on the periphery, blurring the line between the spectator and the spectacle. 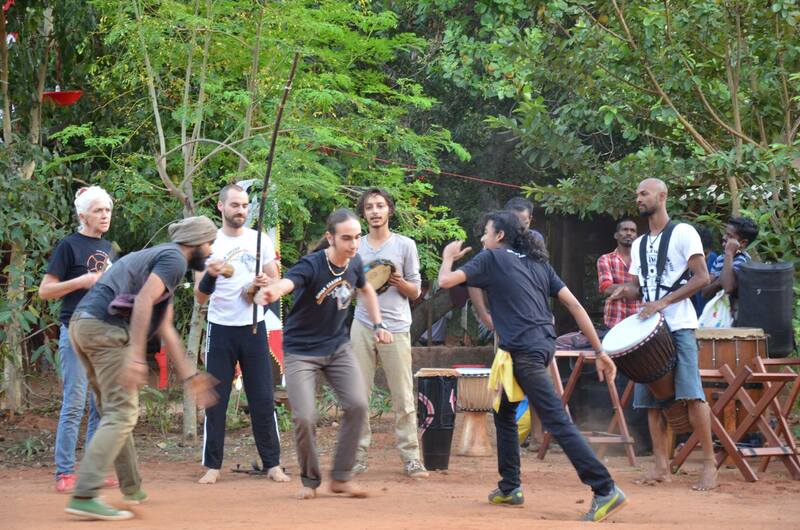 “Tantrotsav is a stage of collective imagination coming together. Kalarigram is an open stage for deep exchange, expression and meditation,” said Lakshmanan Gurukkal, who heads the Sangham’s unit adjacent to Adishakti. For participants, the fifth edition of Yogeeshananda Peetham’s annual celebration of Tantra, a philosophy rooted in the divine dance of Shiva andShakti , offered an immersive experience. The experience included satsang sessions; Pralaya Yoga classes by Laurence;Kundalini Beejamantra meditation guided by Lavanya Rao; Tantra practitioner, which offered “a way to release blockages of karmic accumulations through the chanting of seed mantras of each Chakra” and an ‘Open House’ on the philosophy behind the festival. Apart from a Theyyam performance, Tantrotsav also featured a satsang on ‘Breath & Emotions’ by Vinaykumar K.J., artistic director of Adishakti, Bharatanatyam, experimental electronica by Aerate Sound, a Butoh performance ‘Sick Dancing Princess meets the Red God’ by dancer and theatre artist Honza, and an evening with the mystic Kabir by poets and musicians Vipul Rikhi, Deepa Kamath and Vedant. The eagerly anticipated performance ‘Bhu’ (by Phillippe Pelen Baldini), was a choreographic and theatrical show inspired by Kalaripayettu , the oldest martial art in the world, portraying the journey of a warrior towards harmony of body, earth and nature. 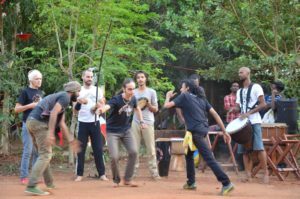 Some of the most engaging moments were from the Mehfil Station Music Band, Vinaitha and group rendered Hindustani classical raagas, the Capoeira demo (Brazilian martial art form) by Sam and team from Auroville and Sargam music band. For many participants, the Noh play ‘Pillow of Kantha’ was a mind-blowing experience. “This is one of the stories that became popular during the spread of Taoism,” said Prabhat of Jeevashakti, a group created by performing art enthusiasts. The post Martial arts, theatre, music and dance come together at Tantrotsav 2017 appeared first on Ginga Saroba.